The Web services support in CICS® Transaction Server Version 3 enables your CICS programs to be Web service providers or requesters. CICS supports a number of specifications including SOAP Version 1.1 and Version 1.2, and Web services distributed transactions (WS-Atomic Transaction). MTOM/XOP: Here we focus on performance benefits that can be achieved by taking advantage of the MTOM/XOP standard to transmit large binary data objects. The single inquiry function of the CICS catalog manager application has been modified to return an image of the requested item in addition to its details. This function is exposed through a Web service. Security: There are a number of ways to secure your CICS Web Services messages. Here we look at two technologies: WS-Security and DataPower®. We compare the performance and relative merits of using WS-Security with and without DataPower, and discuss what factors might influence your choice of technology. 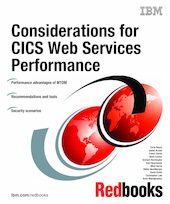 This book considers performance by using different scenarios including Security, MTOM/XOP, and the use of the IBM Tivoli® Monitoring tools to help identify problems that can affect the performance of Web Services. Specifically, we use ITCAM for SOA and OMEGAMON XE for CICS on z/OS to show how these tools can be of benefit to identify the cause when the performance of a Web service in CICS becomes unacceptable.